27% of Netflix subscribers in Canada watched at least one episode of House of Cards within the first twenty-seven days of the show’s release, according to our recent research. But did all those viewers ‘binge view’ the series? Some did, but many are watching at their own pace, according to the research. One-in-three (30%) House of Cards viewers watched all 13 episodes in less than four weeks of its release, 34% watched 4-12 episodes so far and 35% are just started, watching 3 episodes or less. The average number of episodes consumed among House of Cards viewers since release was 7.1, suggesting that when left to make their own scheduling decisions, viewers consumed about 2 episodes per week. ‘Binge viewing’ was significantly more prevalent in the 18-34 demographic – the new generation of TV viewers. 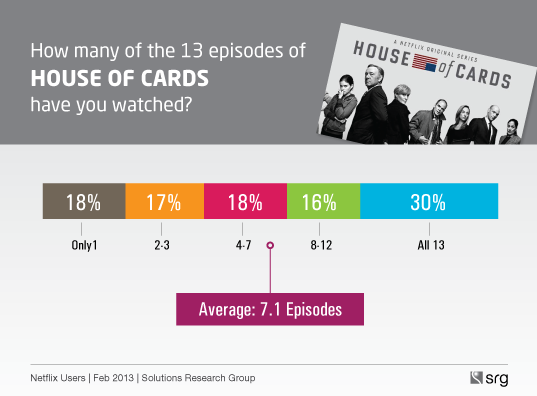 Among viewers of House of Cards in the A18-34 demo, 40% already watched all 13 episodes. Among viewers 35+, only 18% finished watching all the episodes. Average number of episodes viewed so far was 7.9 in the A18-34 demo vs. 6.1 among A35+ viewers. The research also found that the total audience for House of Cards could double over the long term. 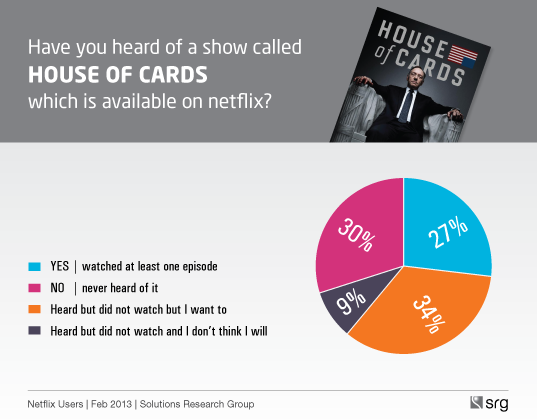 In addition to the 27% of Netflix subscribers who have started watching, another 34% said they have heard about the show and would like to watch in the future. Technical: The research was conducted online as part of a national Omni study of 1,200 online Canadians between February 28-March 1, 2013 by Solutions Research Group (SRG).